TBILISI, DFWatch–83 percent of residents in Marneuli, a city in southern Georgia, are Azerbaijanis. Nearby villages are inhabited by Azerbaijanis too. Lack of knowledge of the official language, deficit of jobs, almost nonexistent infrastructure – this is a short list of the problems that people living here complain about. Also, there are issues that Azerbaijanis do not often pay attention to, busy as they are with handling day to day challenges. One of these issues is gender equality. Even in the city Marneuli, which is a bit more developed than nearby villages, men’s approach to women’s rights is that they think women should only be concerned about family and children. They think this is a tradition and does not need to be changed. But women are of a different opinion. Turac Ibrahimova is 26 years old and this is the 8th year she has been earning her own money. She’s a deputy coordinator at Marneuli Center for Civil Engagement/USAID and often has to organize presentations and events related to gender issues. Turac says, even the meetings, held to inform women, men attend without their wives, who are left at home. Turac found her first job at Marneuli TV after attending English and computer courses. The courses were free, provided by Azerbaijani Women Union, but only a few girls studied with Turac. There are 8 schools in Marneuli, and at 3 of them the study language is Georgian. The Georgian University in Marneuli was closed, and now here are only two universities left: Ukraine University and Heidar Aliev Univeristy. “In these universities, the teaching language is not Georgian. Even in the schools, pupils study in Georgian only till 5th or 6th grade, then it’s getting harder to study physics or chemistry, so parents transfer their children to Azerbaijani Schools. That’s why the older generation does not know the state language, but youngsters started learning it,” Turac said. The government’s new initiative “4+1” has been implemented since 2010. The program was developed especially for ethnic minorities who pass entrance exams at Georgian state universities. The first year, these students are taught only Georgian language, and after that they are allowed to start their four-year bachelor course. Sabina Talibova, an active member of several NGOs that work on women’s rights, thinks that this program has caused changes in the state language studying process and gender issues. „It’s very good that students have to visit Tbilisi daily. They perceive themselves more as a part of the country, become more independent, make new friends, etc. They are eager to study,” Sabina said. Kizil-ajlo is one of the biggest villages near Marneuli. Besides, it’s very close to the city, Turaj says. Here people do not think women need education and they support marriage at an early age. 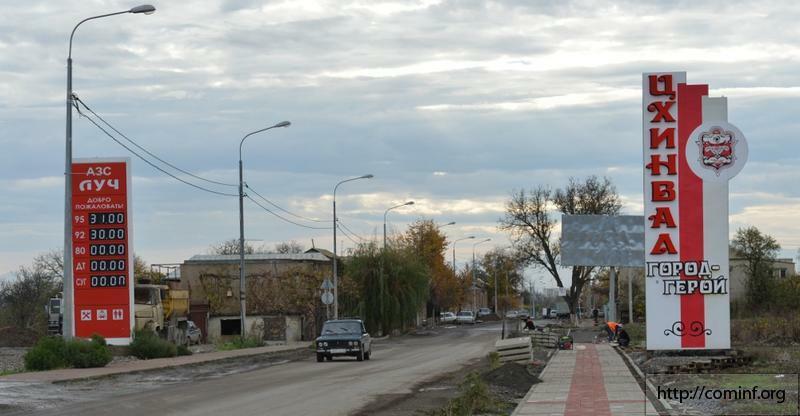 One street in Kizil-Ajlo that ends at school is quite long and small houses are lined along both sides of it. Men can be found in cars or at Chaikhana (tea house). Gates are permanently opened and closed, women work, come out in the street for the water that flows all along the street in a small channel. As soon as women see strangers, they close the gates and hide in the houses. Even when we managed to get closer to a few women, they refused to talk to us and said that they don’t know Georgian or Russian. Only one girl, who did not introduce herself, said that even if women knew the language, they would not speak with journalists. “Probably, if I was born here, I would not talk to you too, but I grew up in Moscow, I know Russian. 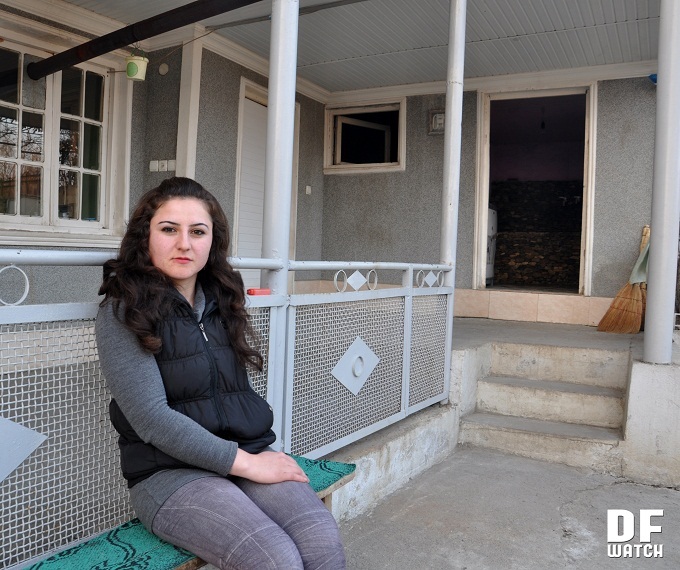 Then I fell in love and got married, moved to Marneuli with my husband and then we came to live here […] There is nowhere to work here, so I’m unemployed, as my husband,” she said. “In some families, the husband is unemployed and does not let his wife work, too, and thinks it is a shame. Only being a teacher is not disgraceful, it’s considered a woman’s job,” Sabina said. She is a 24 year old teacher who lives in the village Sabirkenti, near Marneuli, and works in the schools very close to her house. Her husband is an employed engineer. Sabina says she feels fine in her village and belongs to a small group of women living here who do not have problems. “In the school where I work, there are four girls in 8th grade who are married. One of them is pregnant. (…) Girls get married early, at the age 13-15, because they want to,” said Sabina. “After marriage which mother-in-law will allow a girl to study? […] Only a few girls who are married are employed, and the number of girls who are single and work is very low too,” Turac said. Sabina Talibova claims women can have an affect on their spouses and change their attitude. She tells of how she overcame her husband’s resistance to accompanying her on business trips. According to Sabina, in the past women preferred to be silent even when they were victims of family violence, while nowadays approximately every fifth or sixth family is breaking up because women have a feeling of protest. Even though Sabina thinks divorce is not the best option, she considers women’s protest to be a positive process. “Women who are victims of violence are often afraid to file for a divorce due to their fear of ruining their public image, also the organization/administrative body which would support the woman who is left alone with kids is non-existent. The court decision obligating a husband to pay child support/alimony also needs time. Even in case such a decision exists, if a man is unable to pay, he usually prefers to go to prison. The amount of alimony varies from 50 to 100 lari, and 100 lari is not enough to raise a child,” Sabina says, and adds that divorced women are mainly supported by their parents. She thinks Turkish soap operas greatly contributed to these changes, because women might even know they have rights but be unable to make use of them. When Azeri women see how women defend themselves in a neighboring country, they repeat those actions themselves. Their attitude towards education has also been altered, girls prefer to get education instead of getting married. “In the village Sadakhlo I have witnessed how boys make fun of girls: ‘They are wearing trousers, going to Tbilisi, as if they will become professors. Who is going to marry them?’ However the number of such girls increases, it’s like a virus, and boys will have to marry one of those girls one day,” says Sabina. However, she still thinks th echanges should come from a different direction. “The problem will not be solved before women are involved in the local government. Moreover, local government budget should be organized along gender lines,” she says.